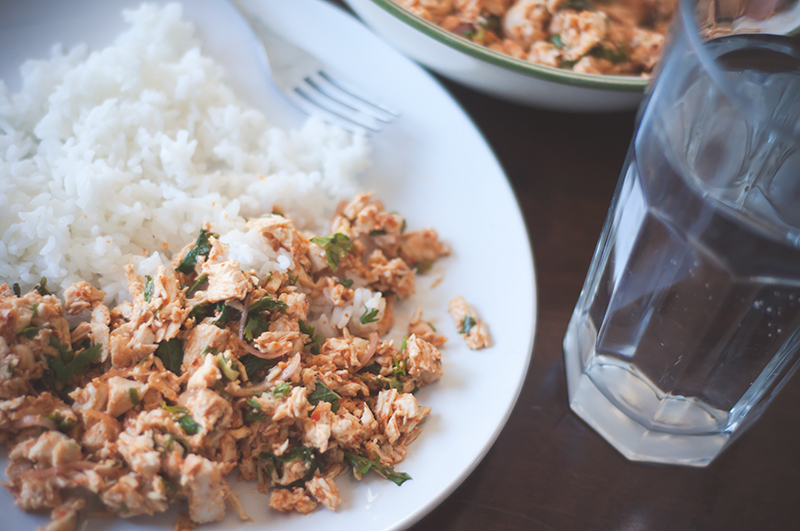 In the past I’ve posted about laab before but it’s one of my favorite asian dishes so I thought I’d take new photos and share my process a little differently. 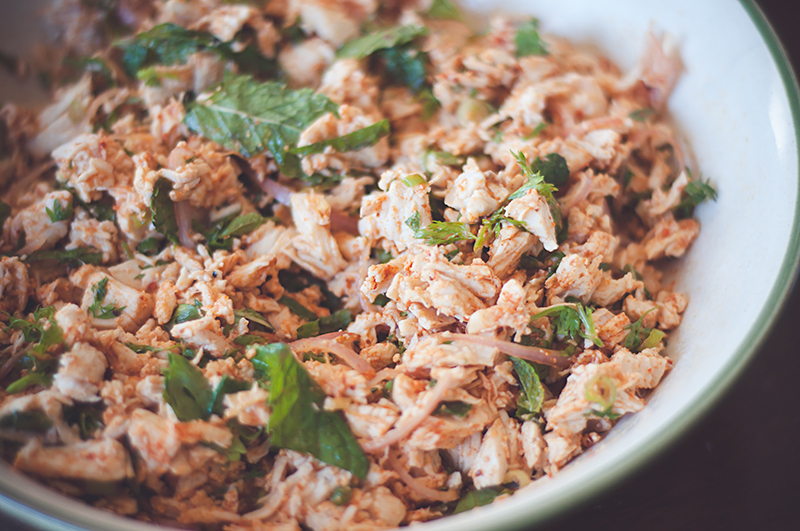 Laab is a spicy chicken, beef, pork, or fish dish usually eaten with lettuce and/or rice. 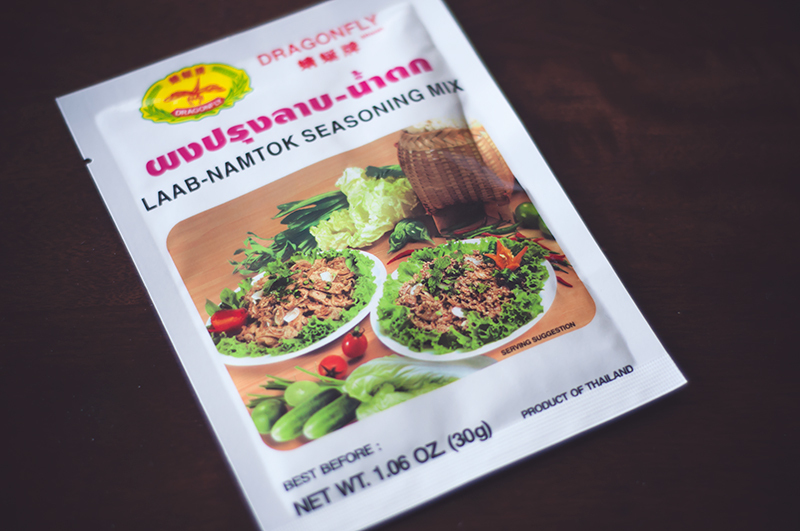 The main spices used to create the flavor are: hot peppers, lemon grass, ginger, galanga, and roasted uncooked white rice. It can be time consuming chopping and roasting the rice and all and sometimes I don’t mind doing that but when I’m short on time or I’m just craving laab way too much, I reach for the seasoning mix. You can buy this mix at pretty much any Asian market. Fresh ingredients. 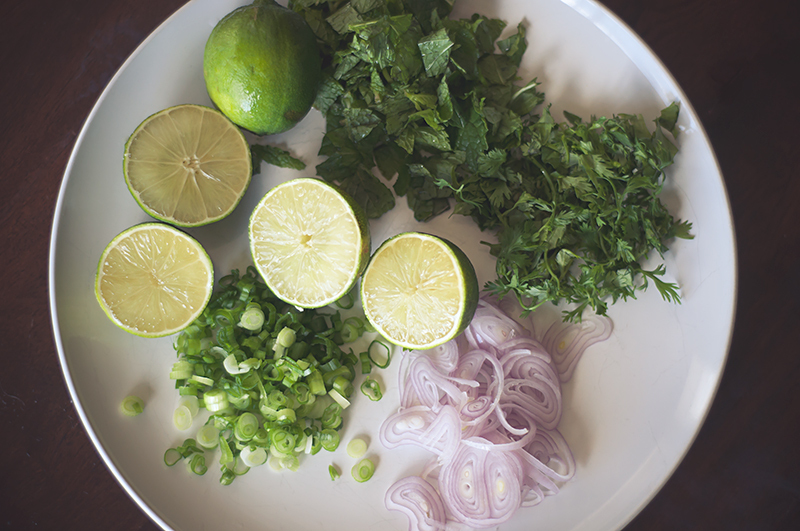 Top clockwise: chopped mint leaves, chopped cilantro, thinly sliced shallots, chopped scallions and limes. I tend to add more lime juice in mine than necessary. One lime should be enough for 1 lb. of meat but I used two. 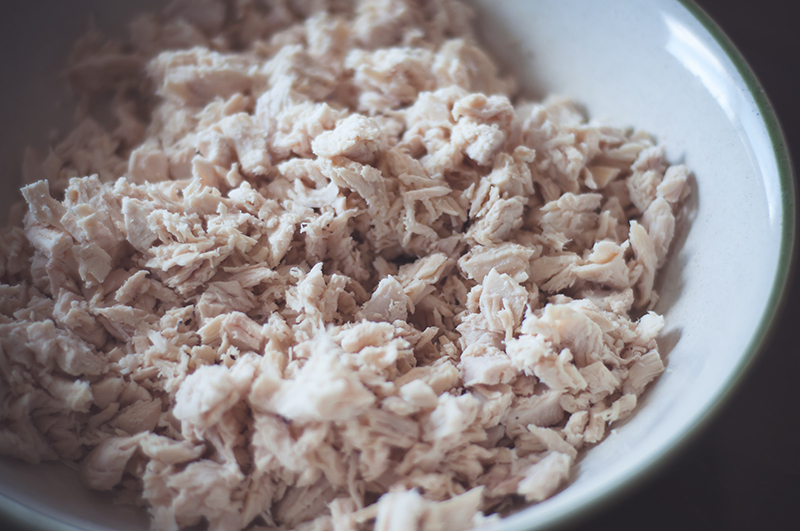 Boiled chicken. 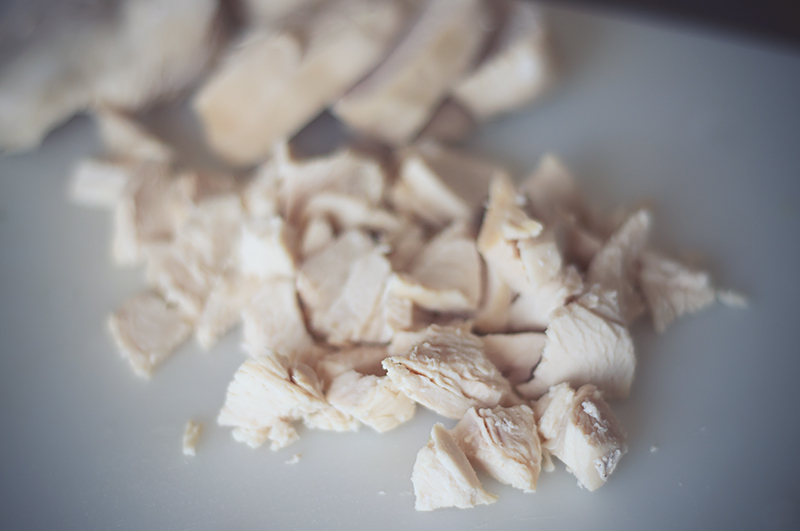 Allow the cooked chicken to cool a little before chopping it up to small pieces. You can also use ground chicken (or other ground meats) and sautee in a pan with a bit of vegetable oil. I prefer it boiled because it’s healthier and less oily. Use a pestle to mash it. I do it directly in the bowl where all the ingredients will go in. 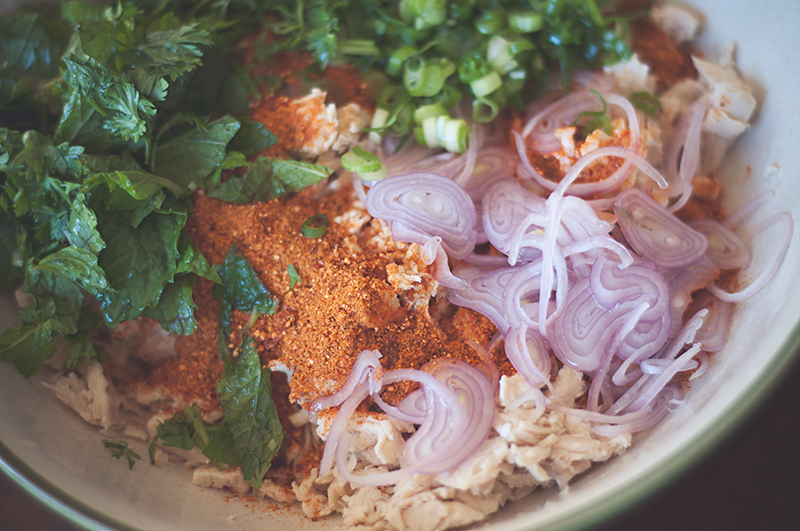 Add the laab mix, the herbs, squeeze in the lime juices, and add a teaspoon or two of fish sauce (not shown). I also add a tablespoon of reserved chicken broth so that it’s not too dry. This is a very spicy salad so have it with a large glass of water.